Today’s classrooms may lack the power sources needed for the BYOD technology used in education. Steelcase Education has developed Thread, a carpet-based power distribution system is designed to provide PreK-20 learning spaces with power where and when it's needed. Thread is a power distribution system that turns any carpeted floor throughout a building into a power source. The patented system uses the building’s power source by running power through a thin modular track designed to be laid under carpet. 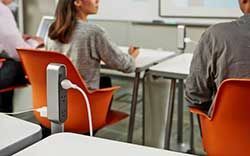 With six outlets, standing, height-adjustable power hubs connected to the track provide support to power laptops and mobile and tablet devices. Visit http://www.steelcase.com/products/computer-support/thread/ for more information.